Ännu en text som är snodd från Facebook. Here are some of my views about ranking within the Bujinkan on a cold,windy and rainy winters day. Soke is beyond the trivial concept of ranks. He has spoken about ranking in regards to sports and budo many times over the years. In the Bujinkan, we have a concept called “Sakizuke”. This is the way Soke received his ranks from Takamatsu Sensei. It is my personal opinion that he respected Takamatsu and the Arts so much, that he clearly understood what was required of him and thus trained three times harder then anyone else. The problem with the new generation ( and mainly the gaijin ) is that we do not understand the concept to our bones and soul. We shy away from accepting a role model, teacher, and also becoming students, disciples etc. We fear we will loose our identity and individualism or, we look at this teacher/student dogma as cultish and refuse to accept anyone as a long term teacher. Being a true budo student is complicated yet very simple. Thus, we see very few out there with the balance of body,mind and spirit to enter the dojo under the tutelage of a teacher. Peoples egos are too big. We live in an era of “entitlement”. It is an era where trust is rare and people find it difficult to be told what to do. Takamatsu Sensei apparently taught whoever showed an interest in his budo. It was important for the continuance of his budo to spread it throughout the land in a hope that one day, someone will make something of it. He was lucky, as Hatsumi Sensei came along and became his deshi. I believe Soke is doing the same. He is passing on his knowledge to anyone who shows an interest in his budo. He has mentioned that it is his hope that one day, some masters from all the thousands will emerge. The more it is spread, the more chance the art has of surviving and ensuring the health and protection of the people of the world. The Bujinkan is more like an organism than an organization. Soke spreads the seeds and some die, some grow into weeds and die sooner than later or become a nuisance, some grow into small trees,shrubs,beautiful flowers, and large trees. Each inhabit a space for a period of time. Some longer than others. Some learn well and have the right heart to endure the hardships and teach what they have learned or spread more seeds for the future. Some just hibernate, some just die and wither away. This is nature. This is the Bujinkan. The Bujinkan and nature is the same. I believe Soke does not try to control mother nature, he rather accepts it and flows with it ( Shizen Gyoun Ryu Sui ). This is a far more powerful way of leadership – becoming one with mother nature. Soke allows what will be, to be. Of course, there must be intervention from man on occasions as we live in the realm of man. Yet, I believe Soke truly is attuned to the balance of Ten Chi Jin and lives in neither realm, but within the space of all three. Thus, he can rise above the trivial concept of ranking that his less than enlighten students ( us ) can comprehend. He leave us to fight and be concerned about these things for our own training,learning and life lessons. If we don`t understand, that is fine. Maybe we will when we are his age? Therefore, just look after your health and train to one day allow the teachings mature where the concept of “grades” is nothing more than “sowing the seeds”. Soke is like a farmer, trying to nurture his crop so it can grow and then assist others in growth and finding a life. However, he is at the mercy of mother nature and as a result, some parts of the crop don`t survive or grow well. We are but rice, scattered by the martial wind to test our resolve as budding martial artists. Some will get it, some won`t. Within this space is where we discover ourselves and what we need to learn to grow and survive. The Bujinkan grades are based on heart. This heart is the heart of “keeping going”. Just talent or technique is not enough. We must have all three ( Sainou Kon KI ) to reach enlightenment ( Rokkon Shojou ). Therefore, I believe that grades are given to those that have shown perseverance and endurance over the years, even if they are not skilled. If they keep going, it is Sokes wish that ( maybe ) one day they will become skilled. Really, we are just children. Here is one way I view some ranks/awards. You can also view from the perspective of Shu Ha Ri. Mu kyu – yet to be thought of by your parents.Lol. Jugodan – 15yr old child ( in samurai culture considered a young adult free to enter life on his/her own ). Shin Gi Tai Bufu Ikkan – Understands the unity of spirit/technique/Body through enduring years of hard training. Dai Shihan – Matured Adult ( experienced lifes trials and survived, leading through example in ShinGiTai, having lived a long life ). “If you think there is something, there isn`t. If you think there is nothing, there is”. The world and those inhabiting it is forever changing and evolving in a tempering process that is infinite, beyond our life time of understanding. Therefore, it is important we try to develop a larger capacity ( utsuwa ) to accept or tolerate these times. I believe Soke has a huge capacity and therefore expresses it by calling himself a UFO. He rises above it all and on occasions, lands to fix things and/or take people for a ride of inspiration to a dimension showing what can be achieved with correct training in heart,body and soul. Those that rise in rank sooner than others, well… it is a test for everyone. It is a test for those that cannot accept it, and also for those who received the ranks. If both parties view ranking superficially and in a materialistic sense, no true understanding will evolve. They may continue training but, the depth of understanding of what they are doing may only ever reach skin or ego depth. They have succumb to desire, lack of maturity, and the unfortunate state of thinking in this modern world. The only way is to live in the Kukan ( space of life ). We must also acknowledge that Soke respects those with “real world” experiences. These people are often ranked quickly out of respect, regardless of their actual dojo ability. Soke says that if these people have seen battle and survived, they understand budo. We have to remember that Soke never saw battle. According to Nagato Sensei, Soke felt for many years that he could not successfully pass on the feeling of Takamatsu Sensei as he had never killed anyone. Therefore, I believe Soke admires and respects those with similar qualities and gives them ranks/awards/status from sincere respect ( among other things ). As a result, we see a wide variety of skill sets in the Bujinkan. Those that cannot or did not accept this manner of ranking have left the Bujinkan or cause problems. These people have their own strong ideas of what ranking should be like and cannot see beyond to Sokes teachings. If you are one of these people, it might be better that you leave the Bujinkan or, just shut up and train. Any issue that arises is not Sokes problem. It is ours. If we cannot accept it, then we have to change it to appease our egos. If we were true students, we would learn to accept the teachings of our Soke. His life is testament to his teachings. Therefore, don`t follow your own way, follow the way laid by 2000 years of Budo transmission. Just as Soke has. I hope that one day enough of us will mature to continue following Sokes transmissions in tune with the path of nature. To know that the path of Man comes from justice. To renounce avarice, indolence, and obstinacy. and to seek the immovable heart. always delve deeper into the heart of Budo. To follow this code is part of the dojo’ guidelines. Måhända att rubriken inte riktigt överensstämmer med inlägget, men denna gång hittar jag inte nån rubrik på texten. Jag har snott inlägget från Duncan Stewart på Facebook. Nu har inte alla Facebook eller kanske inte läser överallt där. Här är länken till originaltexten: https://www.facebook.com/BujinkanTasmaniaTokuBuRyuSuiDojo/photos/….. The Dojo is not a mere social outlet, nor a place where people can appease their desires and do what they want. Budo is military and thus, the fundamental basis is to listen and learn, and entrust oneself to Mu and the teacher. Taijutsu is the art of the body. We are learning the technical body art of war. This must be remembered and thus the right attitude and spirit developed from the beginning. This is why we have Seishin Teki Kyoyo at the commencement and conclusion of keiko and paramount in every art learning top killing techniques for survival. People enter the dojo with too much of themselves. The concept of “emptying one cup at the door” is so important. Even those who have trained a long time have yet to relinquish their ego and beliefs. The only way to understand, is to be a bug on the horses tail. Bad habits come in all guises. Purification of the self is searching deeply and being sincere enough to “feel” ones shortcomings and then have the courage to weed them out through blood,sweat and tears. In other words, Musha Shugyo. In the old days, the truth of the budding students character was shown through having to endure being uke for a long period. Or, clean the dojo and do errands. Nowadays, we often see students enter the dojo and are able to practise waza straight away and not have to lift a finger to clean or assist in dojo maintenance. This is the consumer mentality. I feel the modern way of many is a sickness, and it breeds students and teachers who will never come close to understanding the heart of budo, regardless of if they train forever. For those who truly have budo in their heart, they should not have to be told to help or clean, etc etc. It should be in the soul of the person. The dojo environment will assist in activating this sense of duty, obligation and selflessness. If it doesn`t, than it is nothing but a hall for sports. The higher ranks have a duty. This duty is to continue to learn and discover their faults. They are then to transmit these life experiences to the juniors to assist in their own development. An example is that the high rank will often be the lower ranks uke. The lower rank will then receive greater ability and knowledge from experiencing the open heart ( shin den ) and open body ( tai den ) of the higher rank. Unfortunately nowadays, we do not see this, as most teachers believe they cannot show weakness or be thrown by lesser ranks. In good dojos, the teacher will often express the essence of waza from taking the role of uke. The ability to receive is the basis of all learning,development and teaching. If the teacher ceases to take the role of uke, a separation occurs in both mind,body and spirit. This move from the path is felt by both students and the teacher and, marks the beginning of the end for the teacher. This is why Soke admonishes all of us not to become teachers but students. The only way is to keep training with the heart of receiving. The dojo is a sacred place. In fact, no matter where you are, if you are holding the budo heart, the very place you stand is sacred. Those that have the true budo heart permeate this and, if we are honest, we can feel something very unique about them. I believe it is for that very reason that they hold a just and sincere heart devoted to a good path. It is this heart that I try to understand in my training. When you enter the dojo, please enter with the Bujinkan heart. Jag hittade en text på Facebook. Den var så pass intressant att jag postar den här. Texten är skriven av Duncan Stewart från Tasmanien. Vill ni veta mer om vem Duncan är, surfa nätet eller fråga mig. Now, if the person enters the dojo with too much ego, the need to maintain their image or, maintain their firm beliefs in the way ” things should be for them”, then it will be difficult. Many people nowadays enter the dojo with a consumer mentality. That is, they believe that the teacher is a service provider and as they have paid money, the teacher has to give them what they want or answer the questions they ask. Well, I laugh at this. But, it is an unfortunate state of society and in some cases creates Mc Dojos that have agreed to cater to these mentalities for pure business. In the case of studying the classical martial arts, it is important to enter the dojo with an open mind and heart. Most people who enter a dojo, really do not have an understanding of what they are in for or to expect. Therefore, it is only with time, that the student will slowly develop the spirit of studying the martial arts if, this is their destiny. Regardless, if a person with a balanced perspective and openness to change internally and externally can continue, they will enjoy and grow from their training. Takamatsu Osensei apparently told Hatsumi Soke that ” There are many real people in the world who are not budoka.” I think this is something very important to understand. In regards to being an uke, we have to understand the current manner of training as experienced in Japan. In order to appreciate or come closer to understanding the level of subtlety and skill, we must be able to let go of our preconceptions of what martial training should be like. We have to be able to put ourselves aside and step into an empty sponge and soak in the truth. Quite a task! Understanding the role of uke is a stepping stone here to really understanding the many messages and secrets of budo. In order to develop oneself, one has to thoroughly practice to enter the moment of nothingness and strike in the space while being nothing yourself. This is moving with the feeling of Mu and can be seen as Mu Taijutsu with the heart of fudoushin. Allowing oneself to experience pain,discomfort and the feeling of not being in control, is the role of uke. The initial attack is about control, however, the role is to then to allow oneself to feel the opposite. If one has an healthy ego, one can allow their partner/teacher to administer these lessons. And, this is exactly what this is all about, the ability to receive lessons!! There are 15th dan that receive painful fingertip lessons to their face and bodies from Soke. To receive from Soke is an honor!! You need to accept it, no matter how painful! This is a lesson of the highest and also gives the receiver and understanding into their own psyche and coping mechanisms. Soke uses the 15th dan to explain and transmit these painful experiences. However, many try to brush his hands away with their own, as he does. Soke just puts it on harder. Well, no one likes pain, but, this experience has many lessons, and if you understand these lessons, you will relinquish yourself and trust Soke. People obviously still haven`t learned that the more you struggle, the worse it becomes for you. Sensei is giving you the experience of human fragility and also the feeling of complete loss of control and helplessness. This is important to experience to maintain a humble and compassionate heart. Especially for the jugodan. Experiencing this is also about trust. I will not go into my many experiences with this with Soke but, he clearly stated this on many occasions in class. If one attempts to escape or fight back from sokes painful lessons, it clearly shows that the individual is not ready for the lessons, does not trust, understand, or even want the lessons. Budo is about understanding ones frailty as a human. with this comes greater respect for others. However, people nowadays are sheltered and have not experienced pain and discomfort. People are growing weak they say. The dojo is a place where one can develop internal and external training in a safe environment. The teachers who administer these lessons with the correct heart are doing so with the desire to help the students develop and be able to cope with life and it`s challenges outside of the dojo. Often we can look at budo training as ” being cruel to be kind.” To the outsider, martial arts training can seem just mindless strength and pain tolerance training. These words come from those who have never trained. Soke has said that people may view you as cold hearted or the like, but it is important to maintain your ground in the knowing that it is the true way of budo. Budo teaches life. And, as we all know, life is not often observed as fair or always plain sailing, enjoyable, pain or sorrow free. This is what budo training reminds us. It conditions us to be able to cope better so we may endure and preserve right to the end. as happily as we can. If we look at the dojo kun ( dojo code ) we can see they are 5 precepts that are essential for living life and not just budo. Budo and life are the same. To receive lessons both physically,mentally and spiritually, one has to trust. And with trust, one looses fear. Fear is the base emotion that hold most martial artists from transcending and growing in all realms. The first stage is to trust. With solid kihon training, one develops skill and confidence and the abilities to control oneself. With this, comes eventual trust of the self. 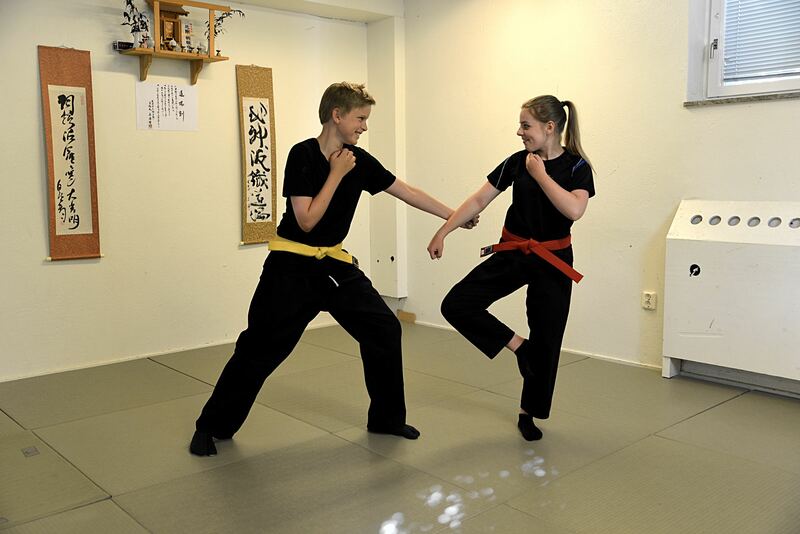 In connection to this stage, the student is developing a trust and relationship with ones teacher and peers in the dojo. Together, everyone builds confidence and trust in each others abilities. When this reaches a healthy stage, then training in the dojo can become highly stimulating and spirited. As you can see, the Ten Chi Jin or fundamental training and repetitive movement, initially by oneself, is essential to mastering ones body , mind and spirt. Being uke is learning how to survive with out having to fight back. It is learning the lessons of how not fighting and allowing nature to take it`s course can keep one alive. If your training is just about learning how to “fight back”, then at a time when this is futile, you have not developed the capacity to accept and the lack of control you face. After all, fighting back is about trying to maintain control. The importance of being uke and receiving is to develop the capacity to understand there a times when fighting back could get you or your family killed or placed in a worse situation. Being uke is learning about staying alive at times when one cannot fight back. In fact, taking ukemi is about staying alive and is in a sense kyojutsu. Fighting to stay alive without actually fighting. Takamatsu Osensei once said to Soke that his understanding of budo was getting better as his ukemi was improving. Now, this art is about survival and ukemi and the art of being uke is about just that. Their are martial arts that only teach how to be the tiger. They only teach how to fight back. If one is set upon by a dozen people and some with weapons, do you fight back like the movies? There are obviously times when there is no other choice, but unless you are very lucky, you may not survive. This is where we have to understand the difference between fighting and surviving. And, this is the difference between Ninjutsu and other budo. Ninjutsu is a holistic art teaching self preservation through understanding the fragility of our own existence. This is also a lesson one receives from being uke. Ninjutsu encompasses ways to hide,run,jump,climb,distract,roll and fall to maintain ones life. These are methods of removing oneself from danger as skillfully and as quickly as possible. These techniques were devised by people almost always outnumbered. Lessons to take to heart. 1. Men,woman and children are grabbed every day for various reasons in these ways and abducted,raped,and murdered. 2. Stepping three times is just a “formal way” of learning to regain composure and balance. 3. Throwing something is a very natural method of self defense for mankind and even apes. 4. Hiding is also an instinctual method of self defense for humans and animals alike. These are very simple examples to show that all kata in the Bujinkan are real and have real life applications if you have the correct mind, heart and training to see. This is why I laugh when people, even those that claim to practise the Bujinkan arts, state that the training is not realistic and not applicable for todays society. I care not for these people that obviously do not see the pragmatism and naturalness found in all waza. It goes to show that these people have a mind set in the way they believe martial arts training should be, rather than give some time and space in their heads to discover that 2000 years of techniques handed down in blood,sweat and tears may actually have something worth learning from. Also, people often try to adapt the waza or “improve” on them before they have even practiced or studied them long enough to “see” and understand the depth and reasoning for such a technique. People are too trapped in the form and just see in a superficial manner. This is low level training in the martial arts. Some people have even said they would not perform sword kata like written and try to improve on it. Firstly, the people that wrote these waza most likely used the waza to stay alive. The kata is literally signed in blood. I find it incredible that instructors who have never been on a battlefield sword fighting or experienced a one on one dual with another expert swordsman can have the audacity to improve on it. These people need to be cut down in my eyes. Training is about breaking down your habits and searching for your weak points. Writing and expressing yourself helps you to do this. But, this takes courage. Often speaking your mind can disturb a harmony yet, this harmony is often only disturbed due to the receivers inability to accept but, not necessarily agree. Training for me is learning about where I am in the moment. From there, you move freely and live as your environment dictates. If we listen to our elders, we learn that ” k sera sera ” is very important. It is about allowing the world to be as it is and, accept everything for what is, going with the flow like flowing water and drifting clouds. Water and clouds have naturally been free for an eternity. There is much to learn from nature.